Mumbo Island is part of the Lake Malawi National Park, which is located on and around the Cape Maclear peninsula near the southern end of Lake Malawi. Mumbo Island reception is on the beach at Cape Maclear. Good tar roads lead almost all the way to Cape Maclear. Once at reception, you can catch the Kayak Africa boat to the island (which leaves at 10:30 or 15:00)and takes around 45 minutes, or you can rent a kayak and paddle out to the island (a distance of about 10kms). Domwe Island is part of the Lake Malawi National Park, which is located on and around the Cape Maclear peninsula near the southern end of Lake Malawi. Domwe Island reception is on the beach at Cape Maclear. Good tar roads lead almost all the way to Cape Maclear. Once at reception, you can catch the Kayak Africa boat to the island (which leaves at 10:30 or 15:00)and takes around 25 minutes, or you can rent a kayak and paddle out to the island (a distance of about 5kms). There are daily flights on SAA from Johannesburg. Flight times also allow you to connect from Cape Town, Durban and other cities. Bottom line – leave home in the morning and by sunset you will be sipping a cold Carlsberg beer or Gin and Tonic as you gaze over the lake. There are daily flights on Kenya Airways via Nairobi; and daily flights on Ethiopian Airways via Addis Ababa. Taking an overnight flight to Johannesburg, South Africa, and connecting from there is also an option. All above-mentioned flights arrive in Malawi around midday, which leaves enough time transfer from the airport to your first lodge of choice. Malawi’s two international airports in Lilongwe and Blantyre have been recently upgraded and are pretty efficient and welcoming. Pre-arrange a road transfer from the airport (or any other pick-up point) in Malawi’s main centres of Lilongwe and Blantyre; from any nearby lodge or National Park; or from the nearest airfield at Club Makokola. 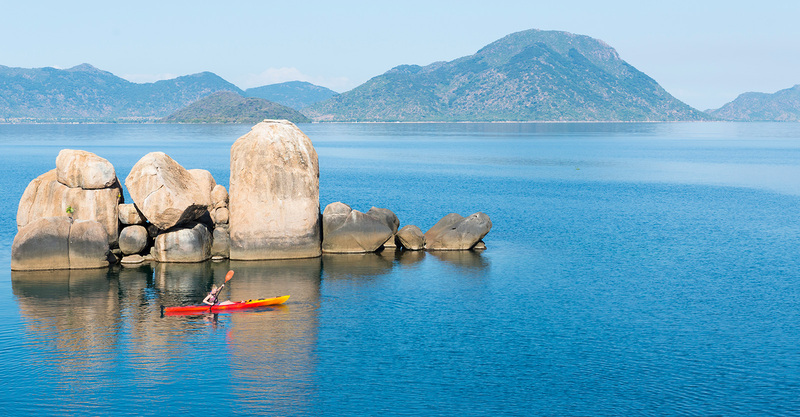 Cape Maclear is an enclave within the Lake Malawi National Park, and is 25km from Monkey Bay (the nearest town). Excellent new tarred roads lead to Monkey Bay, and a scenic winding newly-tarred road takes you the final 18km to the National Park and beach. All turn-offs are well sign-posted, and 4×4 vehicles are not required. Secure parking is available at all Cape Maclear lodges. Catch a private air charter from Lilongwe/Blantyre to the lakeshore airstrip at Club Makokola, followed by a road transfer for the remaining 50km to Cape Maclear. The flying time from Lilongwe/Blantyre to Club Makokola is 40 minutes, and the driving time from there to Cape Maclear is one hour. A great way for some cultural exposure, and cheap but slow and steady. There is an extensive bus and minibus taxi network in Malawi, with many vehicles moving each day between all towns. Allow a full day to get from Lilongwe or Blantyre to Cape Maclear, with the route almost always going via Monkey Bay. It is possible to travel to Cape Maclear by boat or yacht charter from, for example Senga Bay or Likoma Island, but it is very weather dependent.